Miraculous Staircase of Saint Joseph This is the miraculous staircase of Saint Joseph at Loretto Chapel in Santa Fé, New Mexico. U.S.A. 134 years since it was built in 1878, it still confounds architects, in the physics of its construction and inexplicable design . The helix shaped spiral staircase has two complete 360° turns, stands 20 feet high up to the choir loft and has no newel (center pole) to support it . Its entire weight rests solely on its base and against the choir loft - a mystery that defies laws of gravity. it is still in use daily for over a hundred years. The risers of the 33 steps are all of the same height. It is made of an extinct wood species, it was constructed with only square wooden pegs without glue or nails. 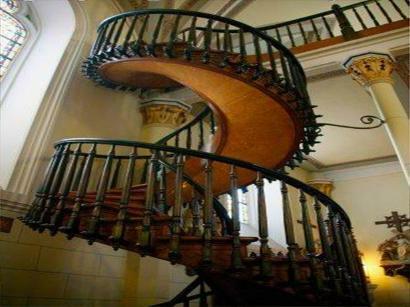 The banisters were added 10 years later in 1888 by Phillip A. Hesch at the Sisters' request. The 33 steps represent the age of Jesus Christ. 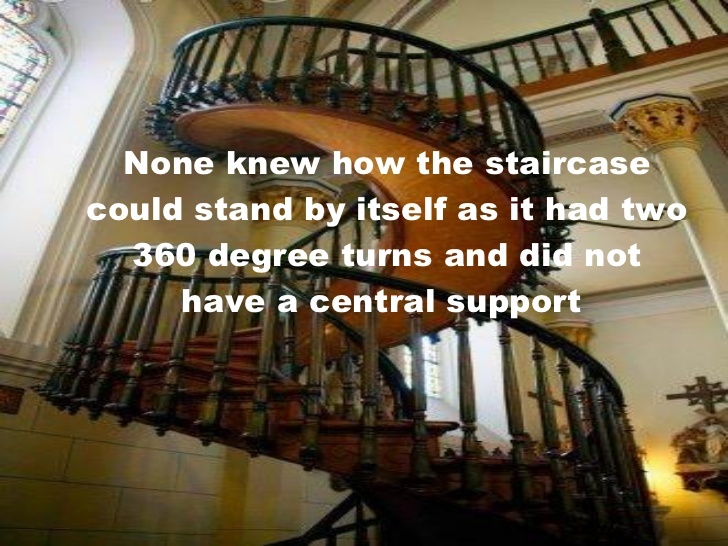 The staircase has been the subject of many articles, and movies including "Unsolved Mysteries" and the 1998 television movie entitled "The Staircase". Mother Magdalen, Mother Superior of the Sisters of Loretto, when the Chapel was completed in 1878, said there was no way to access the choir loft twenty-two feet above. Carpenters were asked to help but all concluded that access to the loft would have to be via ladder. The Sisters of Loretto made a novena to Saint Joseph, the Patron Saint of Carpenters, and on the ninth day a gray-haired man came to the convent on a donkey with a toolbox and approached Mother Magdalen. He asked if he might try to help the Sisters by building a stairway but he needed total privacy. He set to work and locked himself in the chapel for three months. The only tools he had were a saw, a hammer, a T-square. When the staircase was completed, the carpenter disappeared without pay or thanks. The Loretto Sisters ran an advertisement in a local newspaper in search for the man but found no trace of him. But Mother Magdalen and her community of Sisters and students knew that the stairway was Saint Joseph’s answer to their fervent prayers. Many think that the humble carpenter was Saint Joseph himself. According to the annals of Mother Magdalen, the construction of the Chapel was placed under the special patronage of St. Joseph "in whose honor we communicated every Wednesday, that he might assist us." Then she adds, "Of his powerful help we have been witnesses on several occasions." At the time of sale in 1971, Our Lady of Light Chapel was deconsecrated as a Catholic Chapel. Fortunately, however, there was such an outcry from the people of Santa Fe, that the Chapel with the miraculous stairs was preserved as a national monument.